Marjorie Liu has the cover for the anthology Songs of Love and Death edited by George R.R. Martin & Gardner Dozois. What a terrific lineup of authors including a new Harry Dresden story, a Kushiel story, an Outlander spinoff and more. 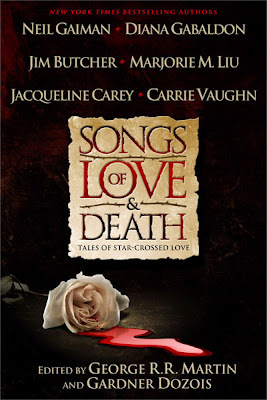 The anthology releases in November. cait045 the entire line-up is strong. I'm also curious about Liu story and the Kushiel story. OMG, I about lost it when I saw this, I can not wait for this! November is too far away! Hawkeye Girl it is a pretty exciting line-up with lots of tie-in stories.